What do you reckon, Chef? 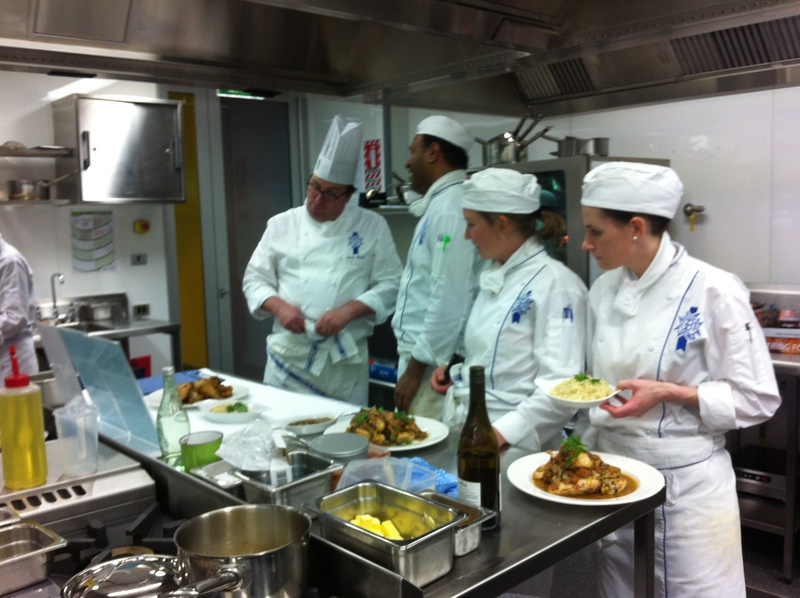 This is what we work towards each day – Chef’s approval and feedback. We’re all here to learn and improve our individual skills but from day one it has been fiercely competitive as we each strive to get the highest mark. As other students takes their plates up to Chef for assessment it’s impossible for me not to divert my eyes from the task at hand to see how high the day’s standard is, and how it compares with my work. For lesson 21 we produce another splendid chicken dish. 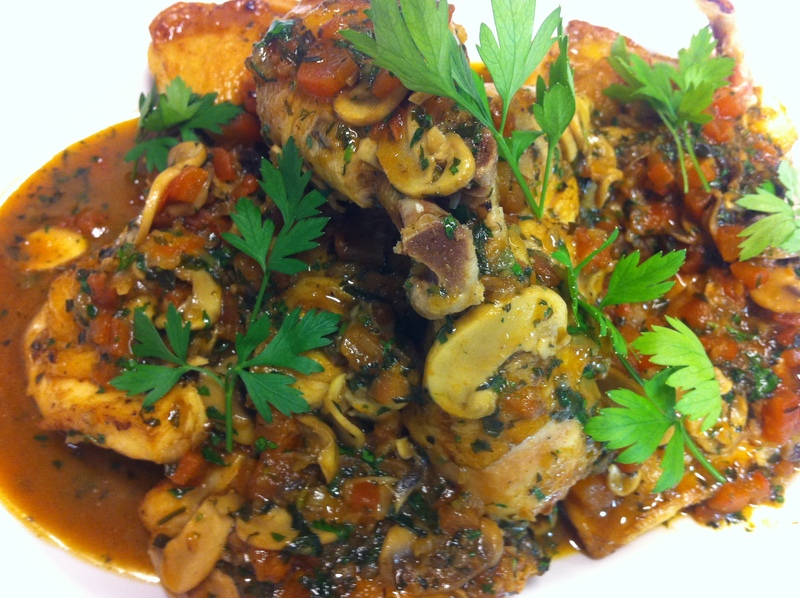 The highlight for me is breaking down the whole chicken into pieces, using the chopped chicken carcass to make jus lie, and sauteing the chicken to serve with classic chasseur ingredients – mushrooms, shallots and lots of fresh tarragon. 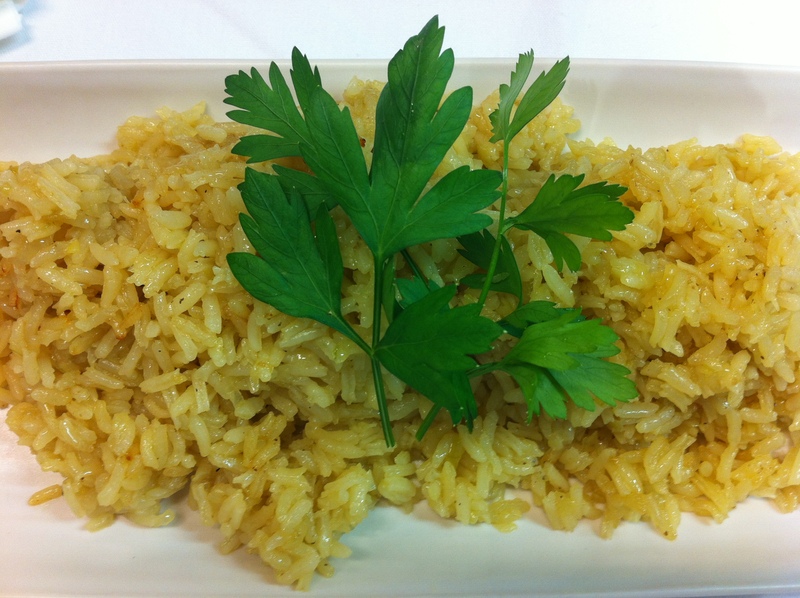 We are also making Riz Pilaff which is long grain rice cooked in stock in the oven. It’s a perfect match with the chicken. 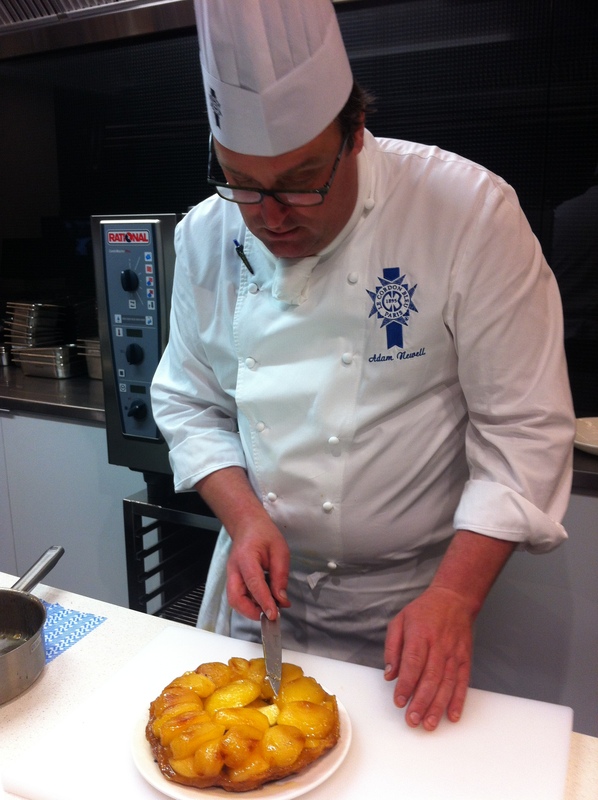 Chef often has an extra treat for us at the end of the week and today it’s tarte Tartin. The smell of the caramelisation of the apple in butter and sugar has the class buzzing in anticipation. It doesn’t disappoint. The apples are quartered and placed in a heavily buttered pan as demonstrated by Kimberley below, and sugar is sprinkled on top. The puff pastry we made last week and froze, goes on top of the apples and when it’s cooked and turned out, makes a light crispy base. 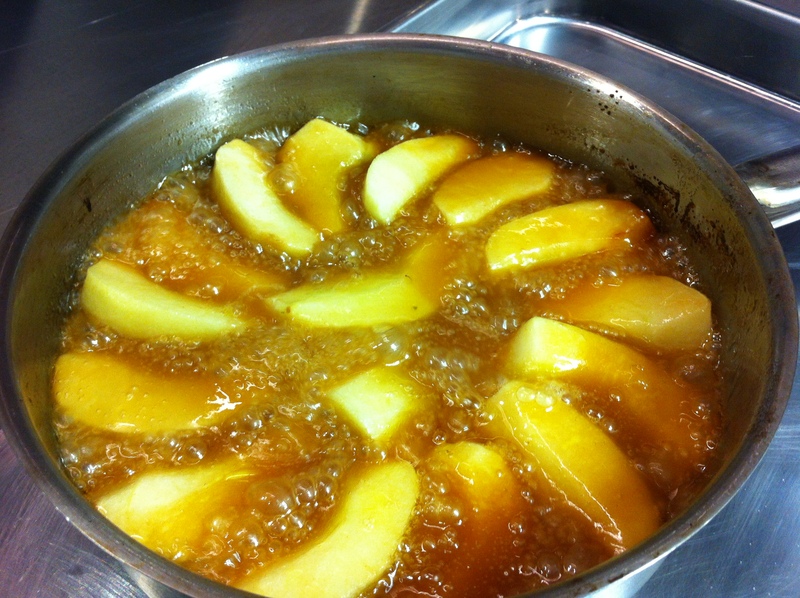 Buttering the pan before adding the sugar and apples to caramelize. There are only two more weeks of school and one day of exams and then it’ll all be over except for graduation on 19 December. I’m trying not to think about life post Le Cordon Bleu basic cuisine. 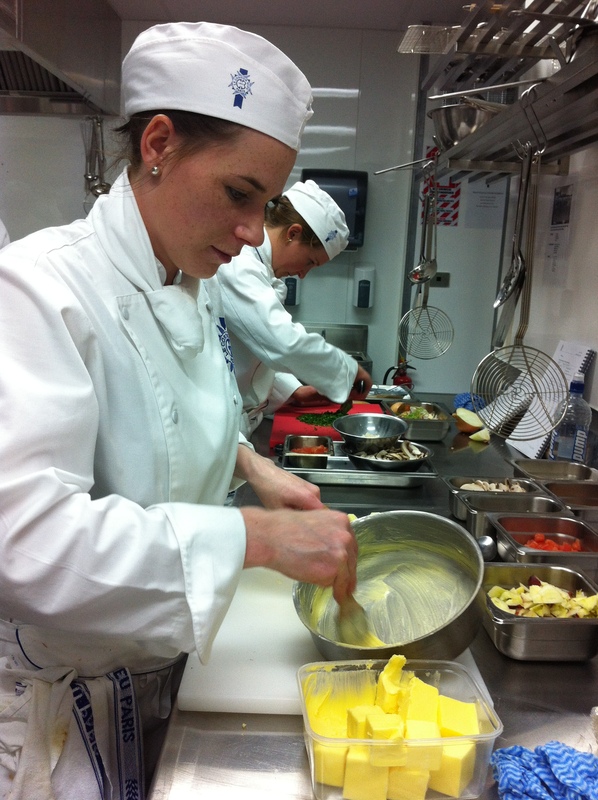 This type of cooking definitely supports the dairy industry! All the dishes look fabulous! Oooohh yes! That’s solved my dinner menu for friends coming tomorrow – I just hope BB&C’s recipe for the chicken is similar to this. Lovely – thank you dear H! Yikes – neither Mrs Child nor Mrs David wrote about this classic so I’ll need to hit the great cookbook in the sky.